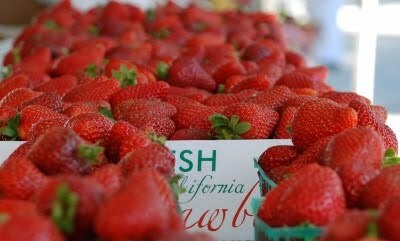 Green SoCal: Farmers Market Restores Faith in L.A. I've been down on L.A. lately as some of my blog posts have exemplified. It's just not easy being green in the land of the big yellow Hummer. It seems the only green most Angelenos care about is the piece of paper with the picture of Benjamin Franklin on the front. But then I have a sublime and spontaneous moment like today when I stumbled onto the Westwood Village Farmers Market. All of a sudden this sun-drenched city doesn't seem all that bad. The Farmers Market is held on Wednesday afternoons from 3 p.m. to 8 p.m. and takes place on Broxton Avenue in the heart of the Village. Vendors come from Fresno, Lancaster and other places to sell their fresh fruits and vegetables. It is all non-pesticide, organic, local and delicious. And did I mention cheaper than the grocery store? It is reassuring to see people in L.A. out of their cars and walking around while enjoying healthy and affordable food from right here in California.